The Central government of India in coordination with state governments has announced the implementation of a new scheme to benefit the farmers. 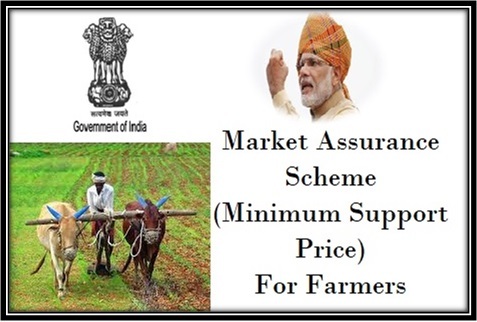 The new scheme termed as Market assurance scheme is a type of scheme that will ensure that the farmers don’t have to face problems with selling their produce at a price that is much below the MSP (minimum Support Price). The central government has also stated that the new scheme will be introduced at the state level within various states. The scheme will be introduced in coordination with government at the state level. According to the state government, the process of implementation will begin in multiple phases within different states for better implementation. The new scheme has been implemented by the central government after seeing the instability within the agricultural sector within last few years due to less produce. The new scheme is also considered as a type of price support scheme that aims at offering with financial assistance to the farmers so they don’t have to suffer loss on account of distress sales. Under the new scheme the central government will set up a minimum support price for each of the farm produce that will vary state wise. The central government has stated that it shall be offering with complete rights to the state government for procuring the farm produce from the farmers at the market assured price. The government can directly purchase all produce from the farmers at the MSP which will only exclude wheat and rice purchase. If in case any state has faced loss from the purchase made then the amount of 30 percent will be reimbursed by the central government to help cover that loss. Under the new scheme the producer can always assure that he shall be getting the assured price for his produce by the state government. This will offer him with financial stability even if the harvest was not up to the bench mark. According to the statements made by central government each of the state government is expected to take full responsibility of the implementation and regulation of the scheme within their respective states. They will have the freedom to set the amount and quantity of crop they are willing to procure from the farmers. The state government will also have a free hand to target other nutritional support programs within their states for running midday meal programs in government owned schools or even to dispose the produce in the international market. Using the benefit of the new scheme the central government aims at offering farmers with much better price for their produce along with financial security. To safeguard the farmers from the getting affected because of their inability of doing marketing; the central government has launched ‘Market Assurance Scheme’. Under this scheme, the central government has allocated Rs. 500 crore by using which the state government is to secure crops price by ensuring the price amount not getting below the MSP (Minimum Support Price). The new scheme has been implemented nationwide to help farmers save the loss from their produce every year. It will offer with financial security to them along with help improve the economy of the country which a lot depends on agricultural sector.